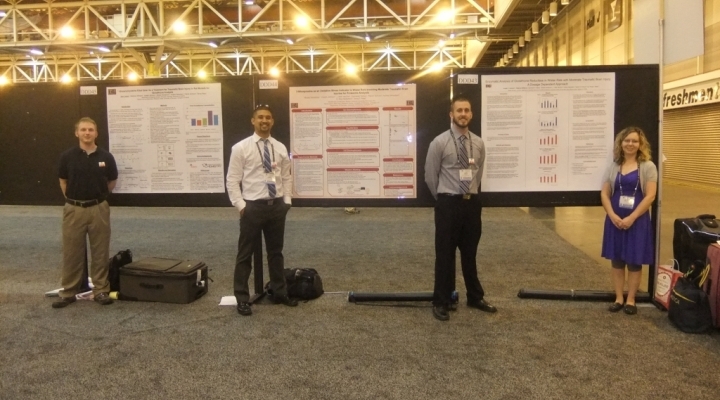 Students complete research projects for credit which counts towards their degree or ACCT credit. Other opportunities include pay or travel. Get Involved with Research Opportunities! 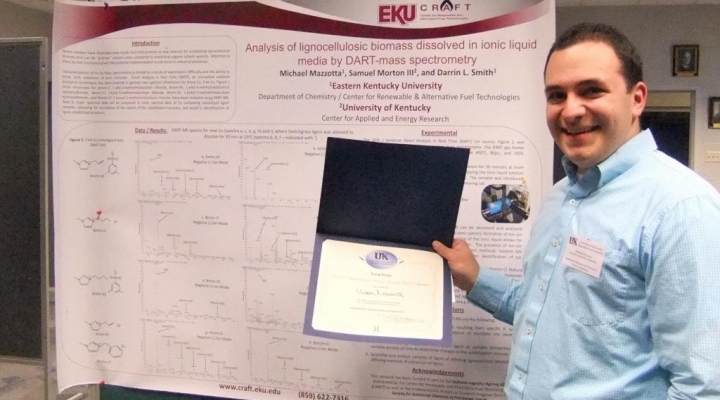 Students can receive hands-on experience with State-of-the-Art Facilities and Chemical Instrumentation while receiving credit towards their chemistry degree, elective or ACCT credit by working with chemistry and forensic faculty on independent research projects. Students that want to perform an independent research project with a chemistry faculty mentor should go to the Chemistry Research Course Information page to learn what type of research courses are available in the Department of Chemistry and the process of starting a research project!! 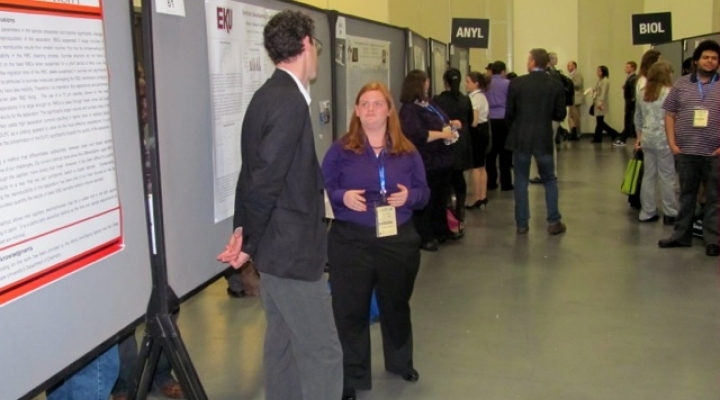 Students are needed to work with faculty on mentored research projects. Students can receive credit for CHE 200, CHE 495A & B, FOR 490 or HON 420. 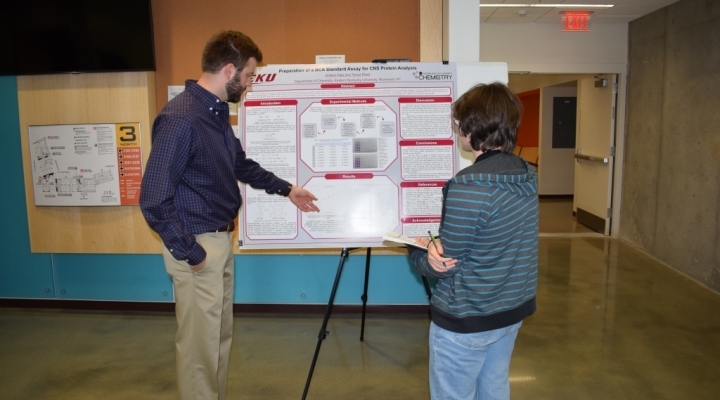 Individual faculty have diverse research projects currently underway in the department. If you are interested in performing a research project in any of these areas or want to propose your own project, please contact us at chemistry@eku.edu or contact the faculty mentor directly. Dr. Abdelhay's research focuses on developing the analytical methodology necessary for the differentiation of regioisomeric and isobaric compounds that are structurally related to designer drugs of abuse of the amphetamine, piperazine, synthetic cannabinoid and bath salts classes. This research is considered as a part of an overall effort to provide for greater analytical specificity in the identification of individual drug species via evaluation of the most likely imposter molecules. The synthesis of the designer drugs that are structurally related to the aforementioned classes of drugs of abuse, thereby creating the analytical challenges is also studied. A variety of sensitive analytical techniques are utilized for performing forensic analytical studies in order to differentiate between the drug of abuse and its related isomers and/or isobaric compounds. These techniques include but are not limited to Gas Chromatography-Mass Spectrometry (GC-MS), Gas Chromatography-High Resolution Mass Spectrometry (GC-TOF-MS), Gas Chromatography with Infra-Red Detection (GC-IRD) and High Performance Liquid Chromatography (HPLC). In addition, Dr. Abdelhay is also interested in the development and validation of analytical methods required for the analysis of pharmaceuticals and drugs in their pure forms, pharmaceutical preparations and biological fluids. Dr. Brock performs biochemical research pertaining to enzymatic activity is specific conditions. Currently, Dr. Brock is pursuing research to develop a method in which cellulose is converted to ethanol from switchgrass utilizing enzymes. However, enzymes are typically unable to perform at elevated temperatures. The discovery of thermophiles has shown that enzymes are able to perform at elevated temperatures. The aim is to collect data from malate dehydrogenase and other dehydrogenases and understand the stability of thermophillic bacteria in order to apply this information to cellulase. In addition, the activity of these enzymes in media that help switchgrass degradation, e.g. ionic liquids, is also being investigated. Dr. Dasari’s research interest is in the field of analytical chemistry, surface chemistry, electrochemistry and materials chemistry. Current work in her group is focused on the development of novel electrochemical methods for characterizing nanoparticles, molecules and polymers in a fast and reproducible manner. The information from these studies will aid in better understanding the fundamental properties of these materials which inturn will lead to the fabrication of ultrasensitive nanoelectronic devices comprising these materials for detecting various analytes. Dr. Jamie Fredericks's research focuses on the application of molecular beacons in forensic DNA analysis. Today there is a growing need from the forensic community and law enforcement agencies to develop rapid, compact and portable devices that can genotype individuals in real-time and in the field. There has been tremendous effort to reduce the time for the PCR and improve the rate of analyzing samples. Although the time for amplification has been reduced, samples still require analysis through an expensive genetic analyzer, a protocol that can take over an hour. By generating a DNA profile in the shortest period of time possible, perpetrators, who would otherwise elude law enforcement agencies may be apprehended, and victims could be identified quickly. This would not only benefit criminal investigations, but also the families and communities involved. Molecular beacons (MBs) are single-stranded, nucleic acid probes that are able to elicit a fluorogenic response in the presence of a specific nucleic acid sequence. In the absence of a specific target, the MBs remain dark. Their high specificity and sensitivity characteristics are highly desirable and have the ability to genotype (both homozygotes and heterozygotes) multiple polymorphisms including SNPs and InDels. 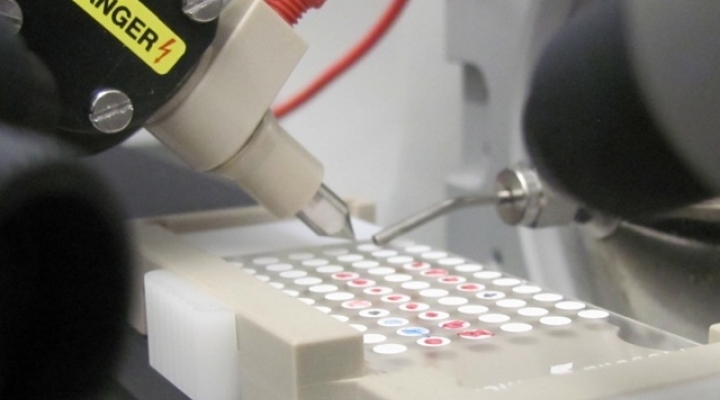 Current genotyping protocols in forensic DNA analysis requires a genetic analyzer. Genetic analyzers are expensive, require extensive training and extends the time taken to analysis samples by a considerable amount. The results of our preliminary study intend to demonstrate the novel application of molecular beacons in forensic science. We have designed MBs that are be able to genotype DNA samples, including hair, blood and saliva, directly and in real-time, thus significantly reducing the time taking to profile individuals. 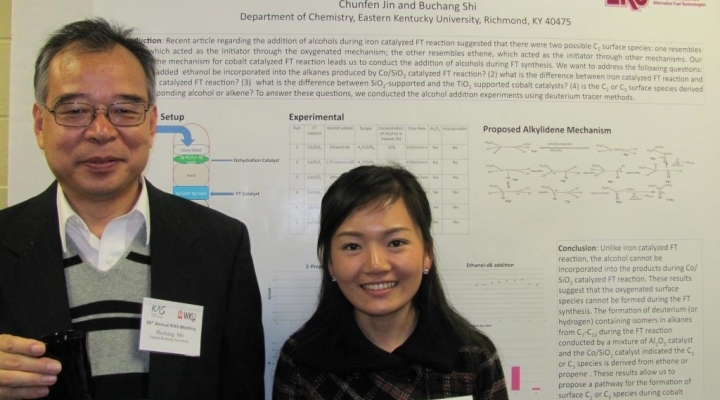 Dr. Pei Gao’s group is interested in the chemical research at nanometer scale. Protein patterns immobilization on surfaces in nanometer to micrometer scale is one focus of this lab. Assembling protein molecules onto designated positions on the surface while retaining their bioactivity is critical to develop new protein based devices such as biosensors and biochips. We are interested in studying and developing different mesoscaled protein patterning methods. Another project is the assembly of gold nanoparticles (AuNPs). Because of the thiol-gold interaction, the AuNPs can be coated with thiol-derivatized single-stranded oligonucleotides to investigate different molecular interaction and recognition, which are critical in the sensing areas. In addition, some advanced characterization instruments, such as atomic force microscopy (AFM), scanning electron microscopy (SEM) will be introduced and utilized to accomplish our project goals. Students interested in nanotechnology and nano-material assembly and related researches are welcome to work in this group. Dr. Jenkins’ research focuses on the fundamental chemistry of materials relevant to energy conversion platforms. Specific topics include the synthesis and characterization of doped semiconductor nanocrystals for solar hydrogen production and electrodeposition of semiconducting polymers for use in organic solar cells, organic light emitting diodes, and other organic electronics. Students with interests in nanocrystal synthesis, semiconducting polymers, solar energy conversion, spectroscopy, and electrochemistry are encouraged to enquire about literature-based and/or lab-based research experiences. In addition to her interests in energy conversion, Dr. Jenkins is also passionate about teaching chemistry, especially at the high school and college levels. Works with those preparing for and/or continuing in teaching careers, so contact her for possible research options in the chemical education field as well! Recommendations for the chemical profiling of smokeless powders. There are currently a wide array of extraction and characterization techniques used by trace evidence analysts to compare the chemical profiles of smokeless powders (both intact and burned residues) which limits inter-lab comparisons. This research aims to provide a platform for comparison that accounts for the inherent differences that arise from the varying protocols. Predictive modelling of algal blooms in local point water sources. As much of southeastern Kentucky is characterized by agriculture – both in family-owned and industrial farming – the presence of harmful or toxic algae in the local water sources can be detrimental. The average farmer cannot predict when or if blooms will occur and will end up treating the blooms with a shock of toxic chemicals that can negatively impact the environment. This research seeks to use analytical techniques identify a combination of easily-monitored variables that would allow a lay person to predict the pending formation of algal blooms, allowing for less-harmful preventative water treatments to be used. Dr. Ndinguri’s research involves synthesis of interesting molecules that have biological and medicinal significance. Research efforts are focused on the development of new small biological molecules and peptide based anticancer agents. Several peptide motifs have been used as vehicles for drug targeting and exhibit a diverse spectrum of biological activities including, antitumor, antiviral, antimicrobial, anti-inflammatory and immunosuppressive actions. Dr. Quan’s research is dedicated to chemical modeling of astronomical systems and currently focused on two types of projects: molecules in interstellar medium and those in Titan’s atmosphere. Interstellar medium: In between the glorious stars, there is no vacuum. This is actually where the interstellar medium locates. Regions in the interstellar medium with relatively high densities are called interstellar clouds and are rich in chemistry. Despite the extremely low density and the relatively low temperature of these regions, many molecules, including organic ones, have been detected towards these sources. Titan’s Atmosphere: Titan is unique in the solar system as the only moon with a dense atmosphere. The physical conditions and chemical composition of Titan’s atmosphere are similar to that of the early Earth. The most abundant chemical species in Titan’s atmosphere are nitrogen gas, methane, hydrogen gas, and more importantly, many hydrocarbons and nitrogen bearing organic molecules. Modeling: Computer assisted modeling of the molecules detected in the universe will lead to a better understanding of the underlying chemistry. This will enrich our knowledge of the universe and may answer some of the ultimate questions of human beings. For example: what is the origin of life on the earth? Can extraterrestrial civilization exist? What will be the best places for people to search for habitable planets? Study of chemistry in the Universe is therefore very important and becomes a thriving field of modern chemistry. Students are welcome to discuss your interests and the research opportunities with me. Approximately ten million people worldwide suffer from a traumatic brain injury (TBI) for which there is currently no cure. My research evaluates the use of a novel drug as a post therapeutic treatment and investigates its remediation of moderate traumatic brain injury. The use of this neuroprotective agent against oxidative stress in this TBI study would demonstrate the prevention of functional neurological decline and restoration of function following brain injury. This project incorporates biochemistry, proteomics, drug therapy, and neuroscience. One of research area is to study the mechanism of the Fischer-Tropsch Synthesis (FTS). FTS is a polymerization process that converts a mixture of CO and H2 to hydrocarbons. Since CO and H2 can be produced from any organic matter that contains carbon and hydrogen, the FT reaction becomes an attractive way to produce biofuel from biomass. This reaction has also been invoked to explain the formation of abiogenic hydrocarbons in the Earth’s crust, the formation of organic matters in the nebula, and the producing precursors of life-essential building blocks. Therefore, the FT reaction is not only important in producing synfuel, it may also be fundamentally important for understanding the origin of life. Our approach in studying the mechanism of FTS is through determining the isotope effect and the isotope enrichments in hydrocarbons produced by FTS using H2/D2 switch and competitive methods. The techniques used in these studies include: operation of fixed bed reactor, analysis of gas and liquid samples by GC and GC/MS, synthesis of model compounds labeled with deuterium. Our recent publications in this area: Applied Catalysis, 393 (2011) 178-183; 398 (2011) 54. Another area of our research is the sugar and chemical production from low temperature pre-treated biomass. Our ultimate goal is to develop a technique that can produce fuels and chemicals from low temperature pre-treated biomass, which could be an energy-efficient and environmentally-friendly technique in utilizing biomass.